We have a Proctor-Silex C36507 Vegetable Steamer / Rice Cooker which we’ve had for ages. Somewhere in our various moves, the manual got separated from the gizmo (personally, I suspect Sue’s piano ate it). For the stuff we usually make, that’s no big deal – dump in water, dump in vegetables, set timer. Tonight we decided to make rice instead of going out in the 100-degree heat to the local Chinese restaurant like we usually do. Of course, the 25-word summary on the back of the unit doesn’t go into details about cooking rice, and the rice bag was similarly un-helpful. Dinner was delayed a bit while we both scoured the Internet looking for a copy of the manual – after all, the Internet has everything – so why wouldn’t it be available there? Well, you’d probably be surprised – we were. There were a lot of requests from people looking for the same manual, without any luck. I did find a manual on manualslib.com However, it was a not-so-great scan of a nearly 25-year-old FAX of a printer’s draft of the manual, complete with crop marks and various spots of indeterminate origin. That wouldn’t be so bad, except that aside from the front and back covers, the actual manual pages had been shrunk to only occupy around 1/4 of each 8.5″ x 11″ page. Since there’s no room in our small kitchen for a microscope to read that, I did a bit of work in Photoshop to resize, crop, and clean it up. The resulting printout is currently occupying a place of honor in the kitchen (on the side of the fridge). On the off chance that you’re one of the dozens of people looking for this manual, I’ve put a copy on my web site here (PDF) to save you the trouble. Note that this is the same manual you can get from ManualsLib, just cleaned up. All credit for tracking down this elusive beast goes to them. I haven’t mentioned it before, but I’m a bit of a clock geek. The technical term for that is “horophile”. I have quite a few oddball timepieces around the house, including the first QLOCKTWO delivered to the US, a pair of Bulbdial clocks, and many Nixie tube and VFD clocks. However, last week I received the largest clock kit ever – the MOD-6_7971 by by Carl Ott and Michael Barile. The completed clock is over 20″ wide and 6″ high, with digits 2½” tall. In my experience, batteries in an APC UPS (regardless of the model – from the smallest Back-UPS to a Symmetra) seem to last about 3 years if I’m lucky. This is in locations with temperature-controlled environments that never go over 80 degrees F.
The following discussion is about replacing the batteries in my APC Symmetra RM UPS. However, much of the information applies to other APC models – only the battery size and quantity will differ. Depending on the model of UPS involved, the first warning you get may be when everything powers down during the bi-weekly UPS self-test. Fortunately, on the larger models like my Symmetra SYH6K6RMT, there’s advance warning when the batteries start to fail. I have 12 SYBT2 battery packs installed in that UPS, and it started complaining about bad batteries about 6 months ago. This gradually reduced the UPS runtime from 3 hours to about an hour and a half as more and more battery packs failed. As soon as the UPS reported a battery pack failure, I removed the pack from the UPS to prevent damage from trying to charge bad batteries. Regardless of age, it is my opinion that a sealed lead acid battery should not swell up or burst unless operated way out of specification. Looking at the status data from one of the battery frames: “1 4 0F WH2149 2149 RT0190 I-0.0 V136.6″, I can see that the float voltage is 13.66 volts (136.6 / 10) which is in the middle of the accepted range for these batteries – 13.6~13.8V/77°F (25°C) and that the batteries aren’t taking any charging current (the I-0.0 part of the status). So there is no reason for these batteries to swell or burst, other than something in the batteries themselves. 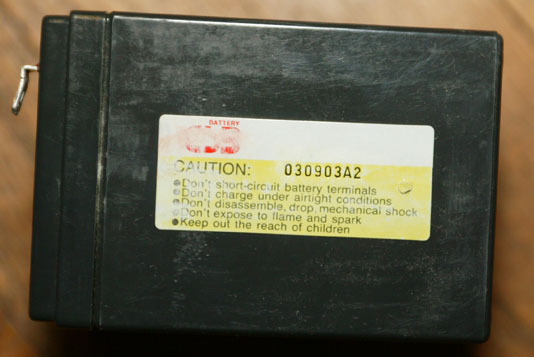 Note that this only applies when all of the batteries in the battery pack are the same brand / model / date code. 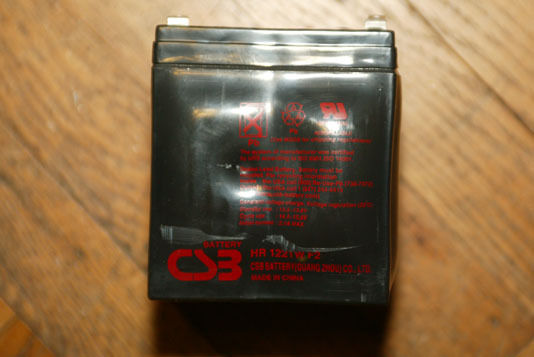 Since the batteries are wired in series, dissimilar batteries may result in overcharge of some while under-charging others. 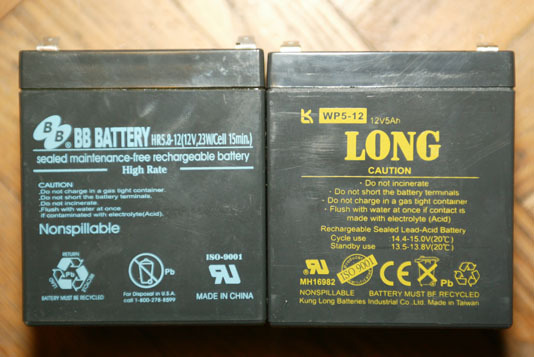 Looking at prices from my previous vendor for the CSB HR1221WF2 battery, they seemed to have doubled from around $18 in 2005 to around $36 now. This battery only has a 1-year warranty. I could purchase two generic $17 batteries with 1-year warranties and still come out ahead of the CSB product. Plus, I’m a firm believer in the saying “Fool me once, shame on you. Fool me twice, shame on me.” and so I’m not going to purchase any more CSB batteries. 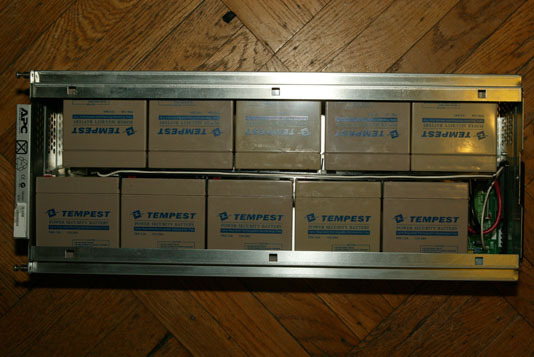 I did a lot of research and decided to purchase the Tempest TR5-12A battery from Batteryspec.com. I selected this battery because it has a 2-year warranty, while most other brands in this size have a 1-year warranty. It was also available with F2 terminals – while APC uses the F2 size, most other applications use the smaller F1 terminal. I spent a lot of time looking at both other battery brands and other vendors. I was quite surprised that many vendors wouldn’t even respond to my inquiry about purchasing 136 batteries. A number of vendors wanted to sell me “equivalent” batteries with F1 terminals and have me install terminal adapters for F2 terminals. 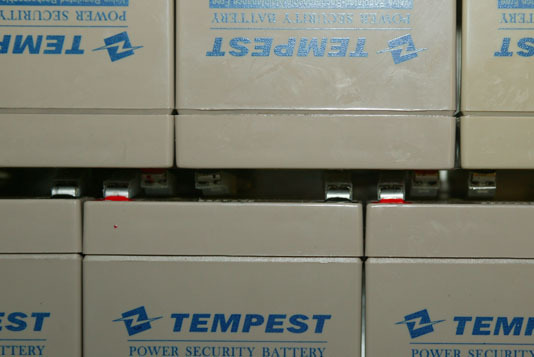 I went with Batteryspec because they answered all my questions promptly, and because they are actually the manufacturer / importer of the battery (if you look at the web sites of Batteryspec, IMC Power and Tempest, you’ll see that they all have the same toll-free telephone number). Let’s compare pricing: 10 TR5-12A batteries from Batteryspec – $156.00 vs. replacement SYBT2 from APC (they don’t sell just the batteries – you need to purchase the whole module) – $419.00. The SYBT2 can be found for as little as $300.00, but that’s still twice the price of 10 batteries from Batteryspec. Plus, you’d be discarding a perfectly good SYBT2 housing. 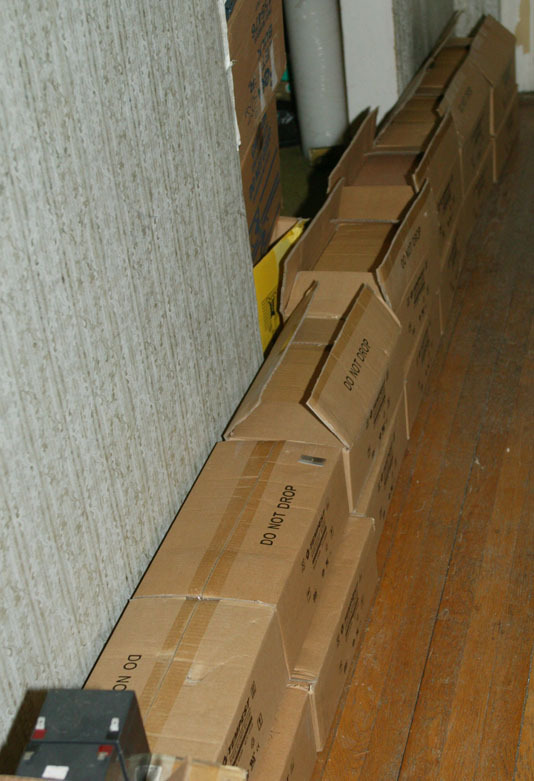 The batteries are spread out to distribute the load across my floor beams. Here is an opened carton of new batteries. Note that each battery is individually wrapped in a plastic bag and has protective covers over the battery terminals. We’ll get to that in a bit. 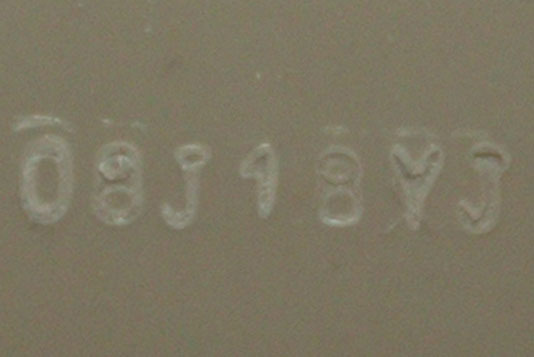 Looking at the date code on the batteries (08J18YJ) we can see that they were made on October 18th, 2008 (J = October). Given that I received them on December 18th, that’s pretty fresh considering they spent a lot of time on a container ship coming from China. I will give you one suggestion, though – make sure that the battery cable connectors make firm contact with the battery terminals. If they don’t, use small needle-nose pliers to adjust the connectors (unplug them from the battery first). Loose connectors lead to high resistance, which may cause the battery pack to not provide full output when the UPS goes into battery mode. Here is a close-up showing the way the batteries are connected. Remember what I said before about the plastic insulators on the battery tabs? Those insulators come in handy when loading the batteries into the housing. Also, remember what I said about many vendors wanting to sell batteries with adapters for F1 terminals instead of batteries with F2 terminals? Where, exactly, is there room for those adapters in here? While I have no proof that these batteries will last any longer than any other brand, the fact that the manufacturer offers a warranty that is twice as long as their competitors leads me to believe that they’ll be better. Batteryspec’s web page says: “6 Year Service Life Under Float Service @77°F / 2 Year Warranty. NonFloat Service / 1 Year Warranty.” I’ll be very happy if I get 6 years out of them. 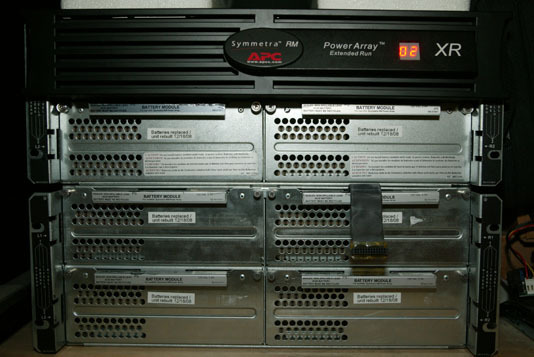 Here’s a picture of two of the three battery frames for this UPS. Each frame holds four SYBT2 battery packs. The dangling cable in the middle of the picture is the front panel cable for the 03 battery frame. The labels on the middle of each battery pack are stickers I made with the date of battery replacement. If you replace all the batteries in the UPS, you can just set the “Last battery replacement” date in the UPS (and, indeed, you should do that). But if you’re just replacing some of the batteries, it is useful to keep track of when each set of batteries was replaced without having to remove the batteries from the UPS to check their date codes. In case you’re wondering why I ordered 136 batteries when 12 frames of 10 batteries each is only 120 total, I ordered another 16 for two other UPS’s that take 8 batteries each. By the way, I recommend that you not do a run-time calibration after replacing the batteries, unless you really need to know the exact amount of time the UPS will run on batteries. It needlessly cycles the batteries and reduces their service life. Note: A Federal law known as the “Magnusson-Moss Warranty Improvement Act” states that manufacturers can’t disallow a warranty claim because of after-market parts unless the manufacturer can show that the after-market parts caused the problem. For example, if you install a new radio in your car, the manufacturer can’t deny a warranty claim for engine trouble. However, batteries are so integral to the function of a UPS that you may have a problem making a Magnusson-Moss claim with after-market batteries. Some models (like the SYBT2) are not available as just batteries – APC only sells the complete battery+enclosure package. Why discard a perfectly good enclosure? Regardless of who you purchase your batteries from, you should consider the total price – batteries, shipping charges, and any tax – being made from lead, UPS batteries are very heavy. Some vendors offer free shipping, while others charge quite a lot. Also, some states require collection of either a refundable deposit or a non-refundable disposal fee at the time of sale. This generally applies only when you and the vendor are located in the same state, and that state charges the fee. Battery Council International has a table here which may be useful. Watch out for claims of “refurbished” batteries. 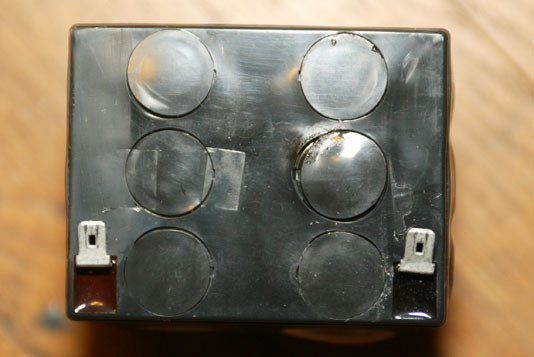 There isn’t anything that can be done to refurbish a sealed lead acid battery. The only thing that can be done is to recycle it – separate it into its component parts – lead, plastic, etc. and use those materials to build new batteries. So, when you see a vendor’s claim of “refurbished”, this means you’re getting somebody else’s old, used batteries. You don’t know what the battery’s manufacturing date is or how it has been treated by previous owners – was it run hot and/or frequently discharged? While researching this article, I found one vendor who was selling used APC RBC14 batteries (at least they didn’t claim to have refurbished them) but stated that they came with a 1 year warranty from APC. I doubt that that is the case, since even a new APC battery only has a 1 year warranty (from date of first retail sale) and these were definitely not new. 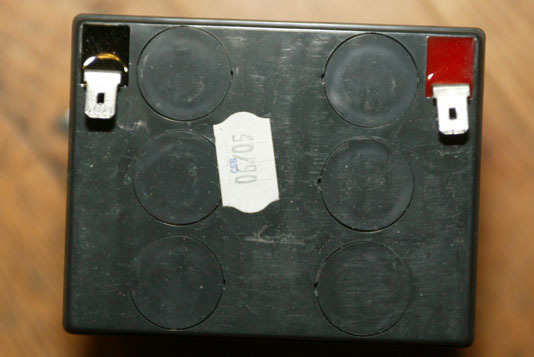 Note that it is possible to refurbish a battery pack like the SYBT2. At a minimum, that would consist of installing a matched set of replacement batteries and functional testing in a UPS. But you should make sure you understand what the vendor means by “refurbished” – I’ve seen some cases where all that was done was to give the battery pack a quick shot with an air duster. One last thing to watch for if you search for an APC RBC part number is vendors that show up in the search results, but who actually sell you some other brand of battery. If you know about this up front and you don’t mind (perhaps because it is priced below the genuine APC part), go ahead and purchase it. On the other hand, if you think you’re getting a genuine APC battery and wind up with a generic one, you’ll probably be unhappy – and even more so when the vendor tells you “of course you can return it and we’ll refund the purchase price, but you have to pay the return shipping, and by the way we won’t refund the shipping we charged you either”. Once you have your new batteries installed, you need to dispose of the old ones in a responsible manner (not just out in the garbage). Many communities have either curbside collection or drop-off service for hazardous waste, which includes lead-acid batteries. There’s probably a limit to how many they will take from a resident, however – I’ve never tried to give them a couple hundred batteries, so I don’t know what the limit is, but it is likely a lot smaller than that. Fortunately, I live within a few miles of a commercial recycler that is glad to accept these batteries – in fact, for large quantities they’ll even pay for them! If you purchased a genuine new APC RBC, there should be a label for free shipping to one of APC’s recycling partners. Otherwise, you’ll need to make your own arrangements to either ship or drop off your old batteries. 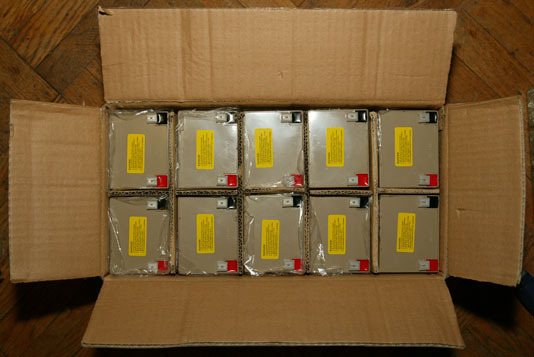 Be sure to factor in any costs for shipping and/or disposal of your old batteries when you purchase replacements. You can visit the EPA’s battery site for more information. for a total of 46 lamps. That leaves the outside lights for now – I’m looking at a fixture called the GB-2000, but I want to get a sample here to test before I commit to buying a whole set of them – my experience with outdoor units like this hasn’t been that great.